MorphoTrust USA and the Tennessee Department of Safety and Homeland Security unveiled self-service kiosks for renewal and replacement of driver licenses and ID cards at approximately 40 new locations, including Driver Service Centers, as well as alternate locations, including public libraries and AAA offices. Tennessee is one of the first states to offer these kiosks in other public locations, reducing customer wait times. 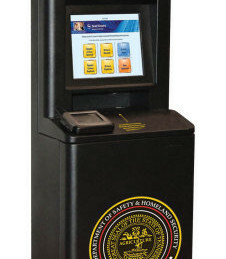 Kiosk users simply swipe their old license, ID or enter identifying information and the kiosk takes a photo and prints a receipt that serves as a temporary license or ID until the permanent one arrives in the mail within five to seven business days. The kiosks are networked with state driver license records and are equipped with image verification software that compares the person posing for the new photo with the previous license photo to prevent identity theft. Payment can be made with credit or debit cards. MorphoTrust is a U.S. provider of identity solutions, delivering driver license issuance systems to 41 of 50 states and the District of Columbia. The company also offers background vetting and other identification services in all 50 states through 1,200 local service centers. The company also supplies biometric systems for the U.S. Federal Bureau of Investigation, Department of Defense and Department of State.